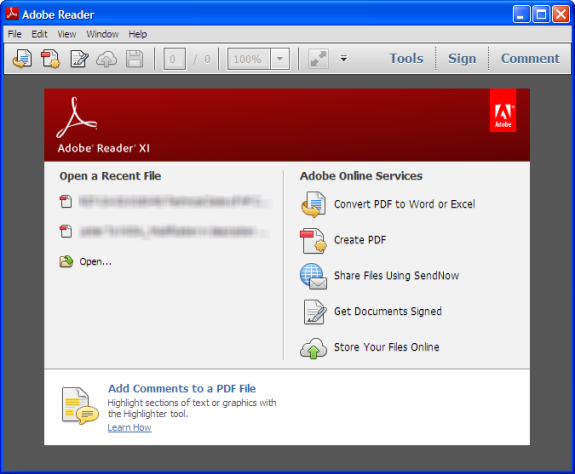 The most popular tool used for reading PDF files i.e Adobe Reader just got a major upgrade. Adobe has released Adobe Reader XI with added security and additional features. It is available for download as a web installer and also as offline installer on Adobe website. I always prefer to download and save the offline installers instead of web installers for any application as they can be used to install it anytime anywhere. It comes with more drawing and annotation tools e.g sticky notes, Stamps, file attachments, audio recordings etc. compared to previous version of reader. Features like sticky note and highlighter tool helps you add comments to PDF files and then save them too. Reader XI comes with a full set of commenting tools. So you can add sticky notes, highlight text, and use lines, shapes, stamps, and a typewriter tool to place comments anywhere on the PDF document. It also comes with the ability to get PDF documents signed by others using Adobe EchoSign® service. Security has been improved using the improved protected view and an additional enhanced protected mode which prevents data theft attacks in case of some exploit related to PDF documents being targeted by hackers. Offline installer (All languages) for Windows here. Offline installer (English) for Windows here.